As Fall creeps up and school looms near, we thought this week’s pick should embody the carefree and playful aspects of summer. Within a few short days, our regular school-day routines will start up again and the memories of sand squishing between our toes and summer BBQs will fade. So celebrate these final days with one of the most simple yet fun games around – the Parachute! This week, save 15% on our Parachute Play by entering the Promo Code BLOGPP13 at checkout. It measures 6 feet with 6 handles so you can play one-on-one or involve the whole family. And if you’re feeling like you should be focusing on school readiness and not play, well the Parachute can help there too! Here’s a post by our brilliant friend Sam Blanco on her Teachthrough Blog about all of the educational uses of the simple yet wondrous parachute. Description: I still remember how excited I would be when the teacher brought out a parachute during elementary school. Even now, I can’t exactly identify what it is about a parachute that draws children in, but I have found that it almost always works even for my most difficult to motivate students. Skills & Modifications: There are many things you can do with a parachute. I’ve listed a few below, but if you have used it in other ways, please leave a comment explaining the activity! Manding (Requesting) – I frequently use a parachute to have my early learners mand for actions. For example, I’ll have the learner lie down on the parachute, then they have to mand for me to “pick up the handle,” “swing,” ready set “go,” or “stop.” I also use the parachute (or a blanket) to teach early learners with autism how to request a parent’s attention. I will have the parent hide behind the parachute, and when the child says “Mommy” or “Daddy” the parent will drop the parachute so he/she is immediately visible and give the child lots of attention in the form of tickles, kisses, verbal praise, etc. Comparisons/Adjectives – To help students understand the concept of big and little, I will have the children stand around the sides of the parachute holding onto it with their hands. I will place an object on the parachute, and we will bounce the parachute up and down to try to get the object to fall into the hole in the center of the parachute. Some objects will fall, but some will be too big to fall into the hole. I will ask the students why the object fell or did not fall. Sorting – I will place several colorful objects on the parachute. We will then bounce the parachute up and down playfully. After a 30 seconds to a minute, we will put the parachute back on the floor, and the student will have to move each object onto a panel of the parachute that matches in color. Identifying body parts – Because the parachute has a hole in the middle, I will sometimes use it for identifying body parts. The learner can lie down on the floor. Then I will put the parachute on top of them. I’ll pretend I’m looking for them (for example, “Where is Charlie?”) Then I’ll position the parachute so that one part (such as their hand or their nose) is clearly visible. I’ll lightly touch it and say “What is that?” and have the student label nose or hand or elbow, etc. Once the learner has an idea of the game, I may let them initiate it, or have them say “Find my nose” and I’ll place the parachute so their nose is visible. Pros: There is a wide variety of activities that you can do with a parachute. As mentioned before, my experience has been that it is a great tool for motivating students who are difficult to engage. The parachute is also fantastic as a reinforcer or to use during a break. 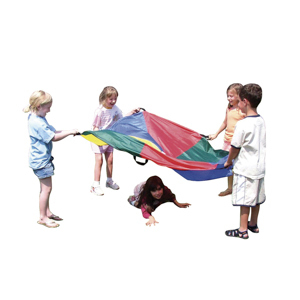 It is fun for students to play hide-and-seek with it, lie on the floor and have you lift the parachute high into the air then bring it down on top of them, or spin it in a circle. One final pro is that, depending on the size of the parachute, you can do these activities indoors. I have a parachute that is six feet in diameter, which is perfect for indoor activities with preschool and early elementary learners. Cons: You have to think carefully about the environment in which you will be using the parachute and choose the appropriate size. Many parachute activities also require more than two people, so if you are working 1:1 with students, you should prepare ahead of time to ensure that a sibling or parent will be available to participate in the activity with you. Remember, enter the promo code BLOGPP13 at checkout to save 15% on our Parachute Play this week only. ***This expires September 3, 2013 at 11:59 pm EST. Not compatible with any other offer. Be sure there are no spaces in the promo code at check out! Written by: Different Roads to Learning on August 27, 2013. This entry was posted in autism, Difflearn Promo Code, Pick of the Week, Playskills, Products, Sale and tagged ABA, Applied Behavior Analysis, autism education, generalization of skills, learning, motivating learners, motivation, teaching tools by Different Roads to Learning. Bookmark the permalink.